Reaction to Under Armour Inc’s (NYSE:UAA) earnings results last Tuesday was somewhere between resignation and skepticism. For a few sessions, the skeptics gained control. While global sales were inching up again, the company is still choking on over $1 billion in unsold inventory, enough to take a year to sell off under normal conditions. It’s going to take a lot of time and brilliant management to turn that situation around without compounding the glitches that got UAA in trouble in the first place. Since this, UAA has regained most of its post-earnings losses. That time factor puts me in the skeptic camp, however. While management is playing a long game, I believe UAA is dead money until we see the sales channel clear out to make room for new apparel collections that can bring the old sizzle back. After all, competition is intense, with Nike Inc (NYSE:NKE) and Adidas AG/S ADR (OTCMKTS:ADDYY) scoring every point of the market they can while their rival is on the sidelines. By the time UAA is done playing defense, there may not be enough time left on the clock. That’s not to say UAA is finished. But right now I see no compelling reason to buy the stock until we get clear proof that the company’s longer-term story is intact. If management can prove next quarter that unsold inventory is dropping without flooding the sales channel, that’s the game-changing move that will signal the bulls. Until then, the shares are still so deeply depressed that I see no urgency jumping in at current prices. The stock is trading around 1.4x anticipated 2018 sales. And remember, 15% of UAA’s entire market cap is now unsold clothes waiting to ship. Last year, that price-to-sales ratio got all the way down to 1x annual revenue. That’s a prospect not even vultures have been feeding on lately. And while UAA is a long way from the 3-5x sales this stock commanded in its glory years, UAA didn’t get a lot of merger offers at that price. And there haven’t been any bids on the way down, either. That tells me that even as an acquisition target Big Sportswear is waiting for things to get worse at UAA before they get better. They’re the ones with their eyes on everyone’s sales trends. If they see UAA choking in the immediate future, we don’t want to be here. Lululemon Athletica inc. (NASDAQ:LULU), on the other hand, is the kind of company someone would have bought out years ago. Now it’s twice the market cap of UAA at half the annual run rate. I once thought UAA would buy LULU, but now it may be the other way around. 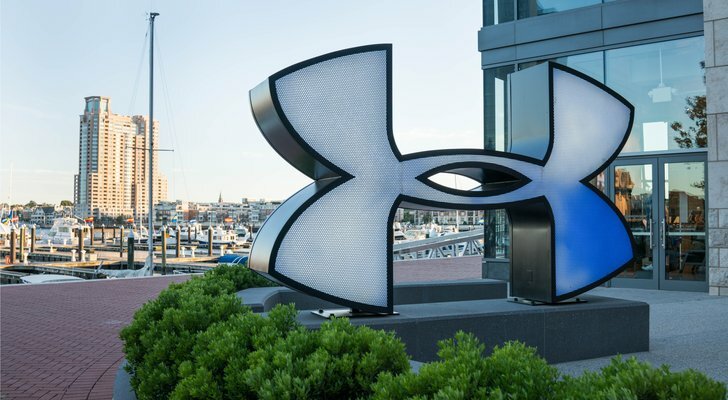 Article printed from InvestorPlace Media, https://investorplace.com/2018/05/under-armour-inc-uaa-stop-playing-defense/.